DBA ICC 2012! Thank YOU! The Daniella Maria Arturi Foundation would like to covey our most sincere thanks to all for your dedication to DBA and for attending the 12th Diamond Blackfan Anemia International Consensus Conference of 2012. ICC was a marvelous meeting and we are very encouraged by the progress in our community! View the ICC 2012 Agenda and read the 2012 ICC Meeting Summary written by Dr. Steve Ellis, PhD. We want to again give a very special thank you to our conference supporters, The Diamond Blackfan Anemia Foundation, Celgene, FerroKin BioSciences and Ambry Genetics! Health—Disseminating and Improving the Adoption of Effective Preventive Measures and Therapeutic Interventions” included scientific sessions and workshops covering a broad range of blood disorder communities. The team from the Steven and Alexandra Cohen Children’s Medical Center of New York presented several scientific sessions concerning Diamond Blackfan Anemia. Dr. Jeffrey Lipton, Chief of Hematology/Oncology and Stem Cell Transplantation at Cohen Children’s Medical Center was a Plenary Speaker for the March 13 Plenary II onPublic Health Approaches To Increasing The Recognition Of Rare Blood Disorders, addressing the topic of, Registries and Data Collection Systems for Rare Blood Disorders. Dr. Lipton also presented on DBA and its broad public health impact in the session on Pediatric Issues In Blood Disorders. Dr. Adrianna Vlachos, Head, Bone Marrow Failure Program, Assistant Prof of Pediatrics, Cohen Children’s Medical Center, and Dr. Johnson Liu, Associate Professor, Department of Pediatrics, Division of Pediatric Cohen Children’s Medical Center, also participated in the session on Frontline Perspectives Around Blood Disorders, with Dr. Vlachos presenting her abstract on Cancer Surveillance Defines Diamond Blackfan Anemia (DBA) As a Cancer Predisposition Syndrome and Dr. Johnson Liu presenting on his abstract Transitioning the Diamond Blackfan Anemia Patient From Pediatric to Adult Care. Dr. George Buchanan, University of Texas Southwestern Children’s Cancer Fund Distinguished Chair in Pediatric Oncology and Hematology Director, was also a featured Plenary Speaker addressing Current Workforce Issues, Historical and Present Challenges, Barriers and Efforts to Overcome Them in the conference’s Closing Plenary. The Daniella Foundation was proud to have the honor of presenting Dr. Adrianna Vlachos with the award for Best Abstract, Epidemiology for the abstract, Cancer Surveillance Defines Diamond Blackfan Anemia (DBA) As a Cancer Predisposition Syndrome Adrianna Vlachos, MD; Philip S. Rosenberg PhD; Eva Atsidaftos MA; Blanche P. Alter MD, MPH; Jeffrey M. Lipton MD, Ph. 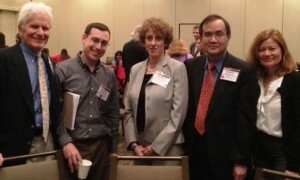 at the two-day CDC National Conference on Blood Disorders in Public Health March 12-14, 2012! ‘Fall’ing….for buncee! Put buncee to work for you this holiday season! As you know, buncee was inspired by Marie’s desire for a more flexible and creative way to send thank you’s, updates and follow-up’s to all of you, our great family of researchers and supporters. It’s the Foundation’s hope that by building an easy, fun and interactive way for people worldwide to share their memories, interests, causes, greetings and more, buncee will become a platform used by millions and in turn help generate millions to fund all your great efforts to find a cure for DBA! We’re excited to report that buncee has received lots of great upgrades over the last few months! It’s now easier than ever to make a buncee and even more improvements are on the way! So, stay in touch with loved ones this holiday season by using buncee.com to create personalized greetings, share unlimited photos, video, messages and more. Remember to download buncee’s mobile app for iPhone and iPad, buncee bits , too! We’re proud to say that buncee bits continues to be frequently featured on iTunes What’s Hot list! It’s free & every time you buncee, you’re doing good by helping us reach our goals for DBA! Own A Piece of History! 200+ Congressional Autographs including President Obama & VP Biden! Need to buy something REALLY SPECIAL for the political junkie in your life ? Take a look at this book we are auctioning at Bidding For Good for the Daniella Maria Arturi Foundation in an effort to help find a cure for DBA. Now’s your chance to own a piece of history and support a good cause, all at once! President Obama, VP Biden, and hundreds of Congressional members autographs from all over the political spectrum! All in one spot…ALL for a cure! Signed by over 200 Members of Congress from both sides of the political aisle including President Obama, and Vice President Biden, this popular Capitol Hill children’s book,House Mouse Senate Mouse, has been transformed into a truly unique one-of-a-kind piece of history! Proceeds from the book’s auction will go toward the Daniella Foundation’s DBA medical research initiatives, which are yielding important clues into bone marrow failure disorders, birth defects, cancer and other widespread disease areas! What is so special about this item is that Congresswoman Carolyn McCarthy of Long Island, NY has found a way to utilize this popular Capitol Hill children’s book as a memorable and effective educational tool for Diamond Blackfan Anemia (DBA). Written and Illustrated by husband and wife team, Peter W. Barnes and Cheryl Shaw Barnes, House Mouse Senate Mouse tells the story of how a congressional bill becomes law in a clever and fun way for children. The Congresswoman has added a brief explanation of DBA and the need for research support for this rare, but complex disorder to the book, and carries it with her around the Halls of Congress throughout the year, including the Presidential State of the Union, to ensure as many Members of Congress as possible sign the book and learn about DBA. This special book has been filled with hundreds of signatures from political leaders from around the country and both sides of the political aisle, making it one of the most unique examples of political memorabilia and a great piece of history for anyone to treasure! We hope you will show your support by checking out the Daniella Foundation online auction and placing a bid on this clever, fun and truly ONE-OF-A-KIND piece of history. The Daniella Maria Arturi Foundation (Daniella Foundation) was founded by Manny and Marie Arturi after the loss of their daughter, Daniella, who was afflicted with the rare blood disorder Diamond Blackfan Anemia (DBA). Unable to produce enough red blood cells, DBA patients suffer from severe anemia, carry a predisposition to cancer, and more than 50% of children are born with congenital birth defects. Manny and Marie created the foundation to try to improve the circumstances for children and families facing DBA by improving the DBA clinical care environment, advancing family and physician access to DBA information and stimulating scientific research to improve treatment options and someday, find a cure for DBA. We hope you’ll check out this truly unique Auction item in support of the Daniella Foundation’s goals! This FOA issued by the National Heart, Lung, and Blood Institute, National Institutes of Health, encourages Research Project Grant (R01) applications from institutions and organizations that propose collaborative, multidisciplinary, multi-Project Director/Principal Investigator research forthe development of new technologies needed to utilize stem cells in future cell therapies to treat sickle cell disease and other blood disorders. This initiative focuses on two key areas that are impediments to further progress: (1) development of techniques to efficiently generate hematopoietic cells by either differentiation of human pluripotent stem cells (PSC) or by cellular reprogramming to yield sufficient numbers of GMP quality cells for clinical evaluation; and (2) development of protocols that enable the efficient engraftment of hematopoietic cells derived from pluripotent stem cells or derived by cellular reprogramming. Each multidisciplinary application will designate two or more Project Directors/Principal Investigators. This program will be implemented in collaboration with the ongoing NHLBI Progenitor Cell Biology Consortium (http://www.progenitorcells.org/) and will add separate additional research projects. Extensive collaboration is expected between the existing Consortium Hubs, and the new group(s) are also expected to collaborate extensively with the Consortium Hubs. Application Due Date(s)October 5, 2011, October 5, 2012, October 5, 2013, by 5:00 PM local time of applicant organization. Research Scope: This FOA is designed to stimulate and support research efforts to define molecular mechanisms regulating the late stages of erythropoiesis. A further objective is to identify new targets that would improve the therapeutic options for erythropoietin-resistant anemias. Mechanistic roles of adhesive interactionsand cytokines in the regulation of erythropoiesis in erythroblastic islands. The role of central macrophages in ironhomeostasis during erythroid differentiation. Mechanisms of the enucleation process and of protein sorting during enucleation. The role of motor proteins in the movementof organelles and vacuoles before and during enucleation. Reticulocyte maturation as a model forautophagy in other systems. Cellular and molecular processes involvedin the clearance of each of the organelles present in late-stageerythroblasts and reticulocytes. Alterations in erythroblastic islandformation, enucleation, and reticulocyte maturation inerythropoietin-resistant anemias characterized by defects in erythroid maturation. Erythropoietin signaling during late stage differentiation and mechanisms of erythropoietin resistance. Model anemia disorders usingpatient-derived induced Pluripotent Stem (iPS) cell lines. Letters of Intent Due: December 12, 2011. Application Deadline January 12, 2012. * One-third of total funding budget geared to projects with more than $1 Million in direct costs. Additional information, including Frequently Asked Questions about the Transformative Research Projects Program is available at: http://commonfund.nih.gov/TRA. The National Institutes of Health (NIH) -“The Nation’s Medical Research Agency” – includes 27 Institutes and Centers and is a component of the U. S. Department of Health and Human Services. It is the primary federal agency for conducting and supporting basic, clinical and translational medical research, and it investigates the causes, treatments and cures for both common and rare diseases. For more information about NIH and its programs, visit http://www.nih.gov.